Looking to take your training beyond Basic? In the 22 MINUTE HARD CORPS Deluxe Kit, Tony includes 3 advanced 22–minute workouts designed to use the variable–resistance Beachbody® PT Sandbag also included in this package, so you build strength, power, and agility—all at maximum speed. And to make it even simpler to plan and pack your rations, you’ll receive a set of portion–control containers. Exclusive Offer! Get a FREE bonus DVD, HARD CORPS: Battle Buddy workout (a $19.95 value), when you order 22 MINUTE HARD CORPS through your Coach or Team Beachbody®. Get “Boot Camp Fit” in only 8 weeks! Now you can “Get Some and Get Done!”—in 22 minutes a day with the quick, military–inspired, no–nonsense workout program designed by superstar trainer Tony Horton. 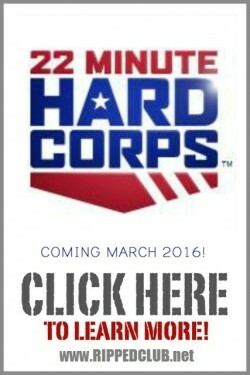 Introducing 22 MINUTE HARD CORPS—you just show up, get tough, and keep up, to get boot camp results in as little as 8 weeks. In 22 MINUTE HARD CORPS, Tony takes the laser-focus and no-nonsense simplicity of Military PT (Physical Training) and combines it with everything he’s learned about creating quick workouts that deliver maximum results in the minimum amount of time. So you get a workout program that works your whole body with moves that are tough enough to challenge you, but straightforward enough for you to do on Day One. The training may be basic, but the results are epic. Tony takes you through a series of total–body rounds designed to maximize strength gains and fat loss with the objective of boot camp fitness in just 8 weeks. Resistance 1. These are 5 simple moves, but with 3 back–to–back rounds, the challenge is intense. That’s how you get results in just 22 minutes a day. Cardio 1. This 7–move workout gets your heart pumping from Minute One. Keep up with the platoon and earn a massive calorie burn. Core 1. It’s called “Hard Corps” for a reason. Get ready to work your lower back, abs, and obliques in this epic, 10–move drill. Resistance 2. Did I hear you ask for more? Here it is. More resistance. More sweat. More muscles recruited. Cardio 2. This is basic training, but there’s nothing easy about it. It’s 3 rounds of 7 exercises, just like Cardio 1, but these moves will push your limits even further. Core 2. You’ve survived Core 1. Now the reps are doubled – to test your limits and maximize the burn. Resistance 3. This workout takes the intensity up a click by adding plyometric strength training to challenge your endurance. Cardio 3. Alternates between floor work and plyo moves for 3 hard-driving rounds. Your mission is to deliver every rep.
Test your limits with a two–a–day challenge week after your 8 weeks are through, and push your results from great…to absolutely epic. SPECIAL OPS RESISTANCE. Three rounds of 5 advanced exercises that incorporate the variable–resistance PT Sandbag to search and destroy any weakness. SPECIAL OPS CARDIO. These weighted cardio exercises utilize the PT Sandbag to boost endurance and obliterate calories with extreme prejudice. SPECIAL OPS CORE. This elite 10–move core workout hits your midsection hard to leave you ripped and ready for action. You’re going to need the right fuel to turn your body into a lean, mean, fighting machine. That’s why Tony includes a set of 7 color–coded portion–control containers to take all the guesswork out of eating right. Inspired by the weighted rucksacks used in military training, this sturdy training tool can be weighted with up to 20 lbs. of sand and used to add resistance to the advanced workouts—and every workout in 22 MINUTE HARD CORPS. 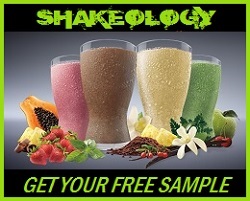 Try the entire program—the full 8 weeks—and if you don’t get the results you want, simply send it back within 60 days for a full refund of the purchase price (less s&h). Think about it. That means you can do the whole program—all 8 weeks—and then decide if you want to keep it. That’s how sure we are that you’re going to be blown away by your results. In fact, we’re so sure, we’ll let you keep all 5 CARDIO and CORE workouts, plus the Rations For Results Nutrition Field Guide, as our FREE gifts—even if you return everything else—just for trying 22 MINUTE HARD CORPS! Consult your physician and follow all safety instructions before beginning this high–intensity and physically demanding and extreme exercise program and nutrition plan. 60–Day Money–Back Guarantee. If you’re not satisfied with your results within 60 days, simply call Customer Service for a Return Authorization number to return the program for a full refund of the purchase price, less s&h—no questions asked.